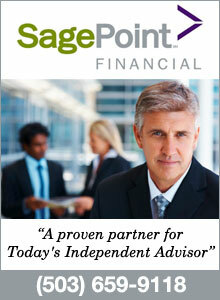 Economic data continue to deteriorate. 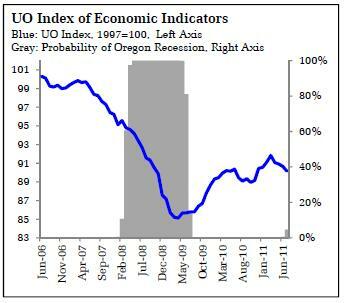 The University of Oregon Index of Economic Indicators™ fell 0.5 percent to 90.2 (1997=100) in July 2011, compared to a revised 90.7 the previous month. •	Labor markets data was on average weak in July. Employment services payrolls – largely temporary employment – fell, suggesting that employers turned cautious during the month. •	Adjusted for inflation, nondefense, nonaircraft capital goods orders again slipped during July. Similarly, Oregon weight distance revenue – a measure of trucking activity – fell for the second consecutive month. Both indicators indicate that underlying growth is tepid. •	Consumer confidence (smoothed with a five month moving average) fell in July, suggesting caution on the part of households. Still, July figures for personal consumption expenditures reveal a solid gain in the wake of a decline in the second quarter. •	The recovery that began in the second half of 2009 slowed to a crawl in the first half of this year, leaving both Oregon and the nation with historically high unemployment. While incoming data remain consistent with disappointingly slow growth rather than recession, the expansion is clearly fragile at this juncture. The Oregon Economic Forum is in its eight year of bringing you timely, in-depth analysis of the national and local economies. As the upward momentum of late 2010 fades, new questions emerge. How sustainable is the recovery? Should the European debt crisis serve as a warning for policymakers? Should we heed this warning and start aggressively paring deficits now, or is it simply premature to turn to policy austerity? How does Oregon’s recovery compare to the nation and the region? What’s in store next for Oregon and the United States? Please join us as we explore the trends that will shape Oregon’s economy in 2012. This year we are bringing two outside speakers. We are excited to have Brad DeLong, professor of economics at the University of California at Berkeley, to discuss the likelihood of a European-type debt crisis in the United States. We are equally excited to bring Glenn Rudebusch, Senior Vice President and Associate Director of the Economic Research Department at the Federal Reserve Bank of San Francisco. Glenn will bring his insightful analysis of the direction of the US economy. We will also continue our tradition of bringing economists from the University of Oregon, including Forum Director Tim Duy. In addition to an Oregon economy 2012 preview, Tim will present new research on state and regional economic indicators?